The OpenShift Enterprise CLI exposes commands for managing your applications, as well as lower level tools to interact with each component of your system. This video guides you through getting started with the CLI, including installation and logging in to create your first project. 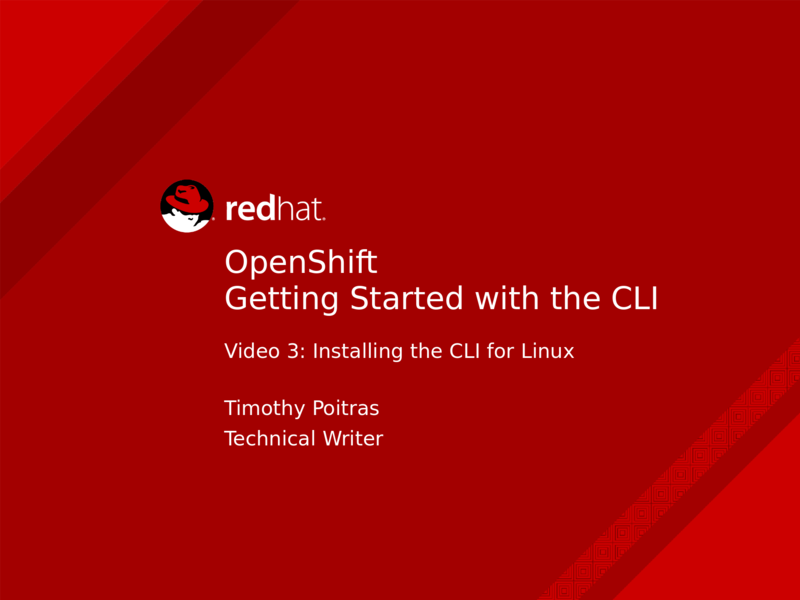 The video refers to the current CLI installation instructions in the OpenShift documentation. As someone totally unfamiliar with OpenShift, this was a very helpful video -- thanks for putting this together! I got the CLI up and running very smoothly on Fedora 24 with these instructions. I have one suggestion -- could you please include the links mentioned in the video here, maybe in the video description? ie. https://docs.openshift.com/container-platform/3.3/cli_reference/get_started_cli.html#installing-the-cli Thanks team! Thanks Dayle! Great idea. I have updated the description to include the link.